Can you believe it has been FIVE MONTHS since I ratted up my freak and let it do .... whatever? If you've known me long, you know I change my hair every five minutes. For the first time in my life, I have found my hair love. Like LOVE. Passion. Why on earth did I not do this sooner? Once I was old enough to get my hands into my own hairy mess, I have never - not once - kept a style this long. Which is another reason it's perfect for me. It can change daily, just on its own. It doesn't even bother to ask. Very rebellious hair, I say. 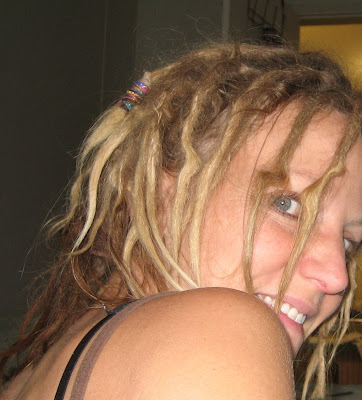 I have researched dreads for years, so I knew long ago I would be going natural. It was a perfect fit for my no-pooing self. No waxing for this dread head. Instead, five months of watching it twist and twirl and frizz like a crazy person. My hair finally matches my psychological make-up. heh. I did get my first, "Mom, LOOOK!" at the store the other day in our small town. I am free entertainment for the locals. Maybe it's time to start charging admission. Two weeks and counting until I start my dreads. I've stopped brushing and when my sister gets a chance to sit down and help, we're going to backcomb - no wax though. 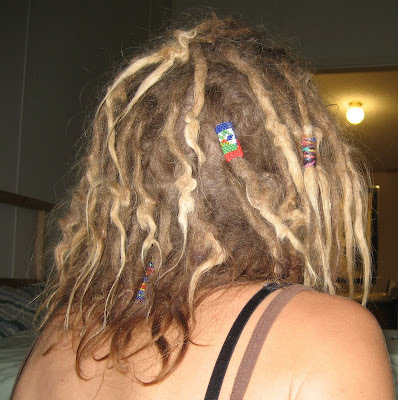 Any advice or tips for a new dread mama? my sister's been dreaded for 12 years now... maybe longer? 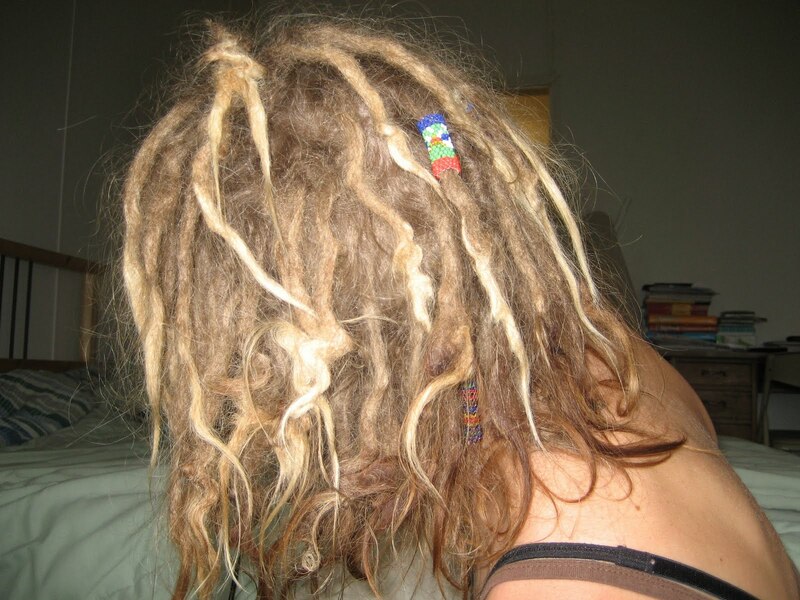 Her dreads are so beautiful. I'll see if I can send a good pic of them. i can email direct, yes? I like you, have a difficult time letting my hair stay the same way for too long. 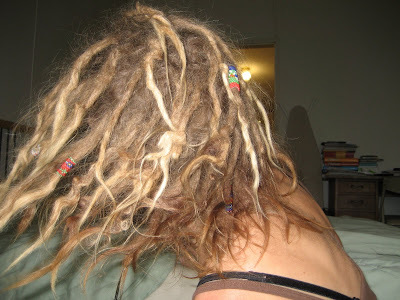 I had dreads for several years, real ones and synthetic. I one day was annoyed with the way they were laying so I haved my head. I was bald for several years. Now, I 'm growing my hair back out to start little dreadies again. IT IS VERY HARD for me to NOT shave my head right now. May hair is about 4 inches long and its killing me!!! But, i'm sticking to my guns this time!! So I will soon be amongst the ranks of Tattooed and dreaded mamas!!!! Oooooh, I would love to be bald! Unfortunately, if you are bald and a white woman, the assumption is, you have cancer.. Hair is such a pain in the patootie.. 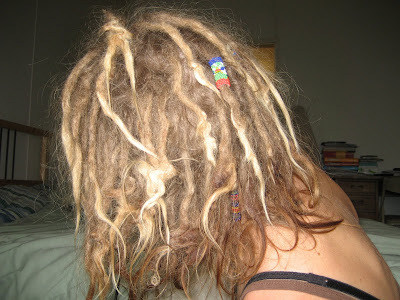 I'm really not that into dreads, but...they look good on you. Sorry! Couldn't resist! Love you to pieces!!! Oh honey. Bless your dear sweet heart. Mine are grumpy. LOL.... and nekkid. They need pretties in them. Still having to backcomb and twist a *lot* every time I wash my head. Been wearing a cover this week to keep pollen OUT. I just want to sit down and play with your hair for hours. I think you look super cute. I was in a little bohemian town last weekend, and they had a drum circle in the city park. A older woman with waist-length grey dreads with all kinds of decorations woven into them walked by, and she was THE COOLEST THING I have ever seen. I took pictures (from a distance, so as to not disturb her) because I was just that fascinated. Start a dread pic day too! !